...and I'm on the wagon, ya heard? 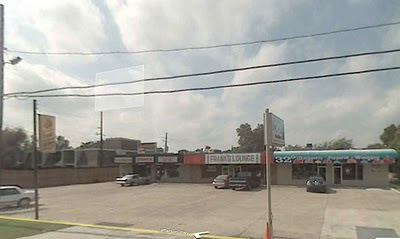 The property seems to be a bar and a daiquiri shop....with video gambling of course. What does it all mean? I have no idea...I was just reading about quantum entanglement when the comment came in. I can explain that if you're interested but not video poker entanglement....which is a largely unexplored science. Everything is connected you know. I love the part in the Sentinel article when the crook from Chicago says that where he's from people are either on one side of the fence or the other, honest or crooked, but in Louisiana, "there is no fence." I think this just adds a little to the feeling everybody already has about this guy. Now, can we figure out which judges recieve campaign contributions from this little crowd? We've got some names of businesses and people now, if the Joe Jaeger businesses are added to the ones connected to ol' $425-a-vote. I hope Letten has some one on this paper trail. When you talked about your long speculative post, I was interested to see those Katrina cars brought up again. So the cars went all over the USA, right? Crossing state lines with them and reregistering them can be a way to get them "clean papers" disguising that they are toxic, potentially life threatening flood cars: messed up electrical, and race to the doctor if your car gives you a scratch. They would have had to go out through the port of New Orleans, wouldn't they? I mean, why add to the risk of taking them over roads policed by people you don't know to some other port where you don't have things sewn up? I've been wondering about that for a while, so the campaign contributors to the Man-Goat-Love-Society's candidate that really interested me were the ones from the various port-related union locals. Talk about "spooky action at a distance", huh? The nola.com link is coming up as "not found" for me. Take one name, plug it in, shake it up, wait for the answer, and sure eneough another 'connected' JP name is sure to come up, somewhere, somehow. Just try it some time, it's fun and easy. Is this the same person from the light reading? Interesting how that out-of-state thing works. I love the comment about shaking the Jefferson Parish 8-ball and will add that the crux now (post-Edwin Edwards) for video poker operations is to use "apparently legitimate front men", you know like politicians, real-estate developers, and self-made businessmen. As for anyone who claims to being self-made because of building up his video poker business (not referring to anyone in particular, mind you), uh, but who thinks the families let anyone new just step in on that business. Recommended reading: "Bad Bet on the Bayou"
This is great; the word verif. is "credboat" as in, "I checked an address on the assessor's website, got an LLC, verified the principals on the secretary of state's website, so now I'm riding in the credboat" All that being more than the Times-Pic has ever done, mind you. Porteous as in Judge Porteous? No way that Capella and Porteous are linked together unless you believe the impeachment paperwork filed against Porteous. Of course Judge Porteous isn't Capella's partner but his son is. So, Zombie, can you tell us more about this Mexican casino? Where sits the still point in the turning world? This is why I find the "Law" of Entropy moot, when matter actually tends to move towards greater orders of complexity. What seems like an actualization of disorder might turn out, upon larger scaled viewing, to illustrate the manifestation of a Higher Ordering. The oxymoron of "Gambling" based on Electronic "Random" Numbers Generation fits perfectly in such a chaotic scene. Ain't nothing spinning in Georges' machines. Hell, sometimes you don't even have to Hold The Goat, and The Sheep will just back right up to you. Isn't that why we have electrons --errrah, I mean, elections? And the goat fucker lost. ooh ooh! Your Word Thingy Formator (WTFr) for this comment is: "unnest"
This is incidental, but since you brought up Quantum Entanglement: I bet you have read Mona Lisa Overdrive by William Gibson. It is the 3rd in a trilogy: Neuromancer, Count Zero and Mona Lisa Overdrive. They are quick reads so I suggest starting with the first one etc. If you have read them then you know what I'm getting at, but if you haven't I don't want to blow the plot for the 3rd book. Suffice to say, the first picture I ever saw of a Haitian Vodou practitioner showed a Priest with a non-novice Sony Camcorder and a Blue Tooth thingy jacked into his ear. In reference to the depressing "Greatest Story Never Told" post, it's getting hard and it's getting fast...and it's getting time for a Meta-level Pop. That is the way electrons jump. Keep your head spinning. Here's a couple of new ones for you. La Louisiane of 725 Iberville, now defunct, was a Marcello holding for the past 30 years. They've sold the property and Maximo's seems to be the new base. 725 Iberville is now a Latin-American steakhouse owned by 730 RUE BIENVILLE. Who might this be? Why, it's the Jaeger-meister. Is a sale just a sale or a pattern when certain people seem to keep selling to other certain people, sort of keeping it in the family. 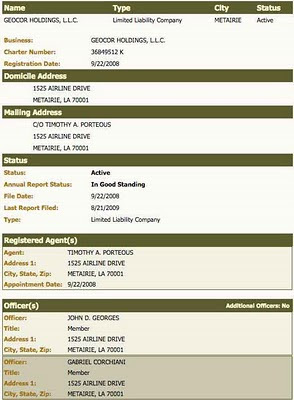 Also, 200 Decatur (corner of Decatur & Iberville), which is now a recently-closed sports bar in front and very-open massage parlor in back, is owned by OREILLY PROPERTIES. Who are the officers...the Motwani's, with agent being Joseph Capraro. This is the same Joe Capraro who, by looking on the SOS site, is quite friendly with Joe and Frank Gagliano.